St Paul's Bessbrook set up an all-Armagh MacRory Cup semi-final against St Ronan's Lurgan as they earned a 0-10 to 0-3 win over St Michael's Enniskillen on Sunday. 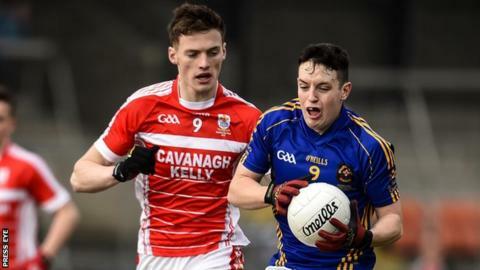 The other semi-final will see St Patrick's Dungannon up against St Patrick's Maghera. Dungannon avenged their final defeat by Pat's Cavan last year by earning a 0-12 to 1-8 extra-time win on Saturday. Cormac O'Hagan's free proved to be winning score at Corduff. Thomas Edward O'Donohue hit Cavan's goal in the first half as the sides were level at 1-4 to 0-7 at the interval. After Dungannon were reduced to 13 players and Cavan also had a man sent off, the holders fought back from two points down to move one ahead late in the contest. However, a Ryan Coleman point ensured extra-time and O'Hagan's free secured Dungannon's victory.